The final episode of Comedy Central's Key & Peele may have aired on Wednesday night (sad face), but the legend of the groundbreaking comedians behind it — that would be Jordan Peele and Keegan-Michael Key — lives on. Not only is the program nominated for four Primetime Emmys this year (results air live on Sunday! ), Key and Peele just also happen to have a meet-cute that will soon become everyone's #MeetCuteGoals. 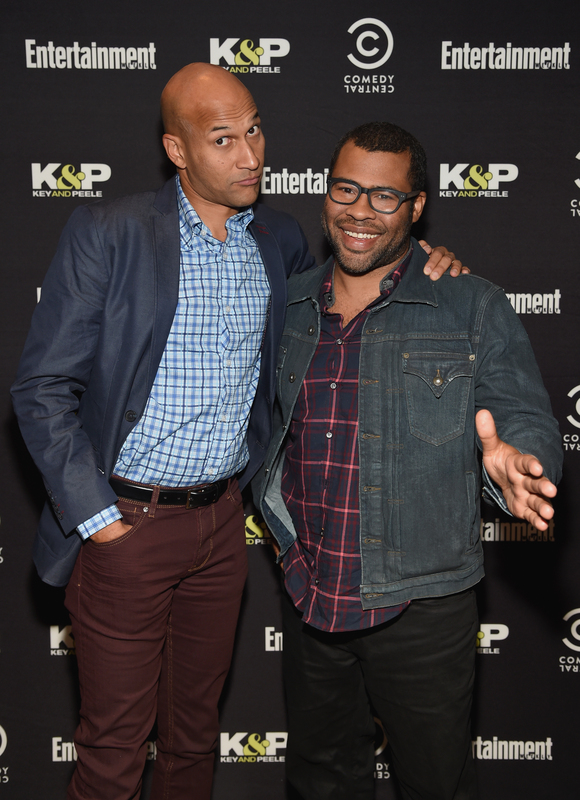 So, how did Key and Peele meet and become best friends/future comedy partners? Turns out, it was in 2002, at the place where many Saturday Night Live alumni have gotten their start: Second City in Chicago. The two bonded over a hilarious misunderstanding during a comedy routine. "We saw each other perform a night apart from each other... Jordan came in and did this character. He was playing a very vapid, Danish supermodel," Key revealed to Jimmy Kimmel in 2014. "She was the presenter of the Eurovision song contest," Peele added. "I referenced something he told me in a story in the night before, and you didn't realize it." "I gave him this Easter egg," Peele explained, even though the whole thing was actually lost on a super oblivious Key. "And I laughed, uproariously, because I thought it was such a coincidence," the other comedian joked, adding that the two "fell in comedy love." Key later elaborated on the pair's history, telling Big Boy at Power 106 that Peele "had traveled from Amsterdam" to perform at Second City, where he had been working at a theater (and no, not in the Red Light District as Big Boy joked). "A friend of ours on our writing staff introduced us. By chance, we both ended up on MadTV," Key explained. "MadTV was finished and about three years later, we have the same manager, and my manager said: 'What would you guys think about doing a show together?' And I was like, 'Why would I not want to do a show with the greatest sketch writer I've ever known in my entire life?'"